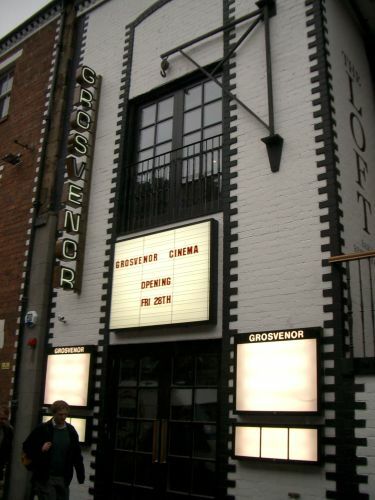 After its official launch last night, I've very happily moved the Grosvenor back into the list of 'open' cinemas. In honour of its new look, the Grosvenor page has been entirely revamped and includes a gallery of photos from the Bafta-sponsored launch party - as well as photos of the new look interior! Just added a wee photo of the new signage being tested earlier this afternoon at the Grosvenor, due to re-open to the public a week today. The revised layout appears to be almost exactly the opposite of what was outlined in the submitted plans described here; the two cinemas are back on the ground floor where they were originally, whereas the upper level is entirely given over to the bar/restaurant. Lots of news coverage of this cinema today, with stories (and photos) in The Herald, The Scotsman, and the Evening Times. Another long gap between updates, due to pressure of work. Many apologies! - The Odeon Clerk St in Edinburgh sadly closed at the end of August; its replacement, the Odeon Lothian Road opened on 5th September. - An application has been submitted to Glasgow City Council to demolish the B-listed ex-Kingsway cinema, and build housing on the site. The developers are claiming the damage to the building after lying derelict for so long is too great to allow even facade retention to take place. - Meanwhile, planning permission has been granted to convert the B-listed ex-Olympia theatre/cinema in Bridgeton into flats. Part of the facade is to be retained, with new windows inserted into it. - The Grosvenor cinema in Hillhead is to reopen on the 27th of November, having undergone conversion to a series of bars and restaurants, which also incorporate two small luxury cinemas. The end result of all this appears to be quite different to the plans described here that were submitted to the local planning department. A full update on the new Grosvenor should be added next week. - The Coliseum, Eglinton Street is now up for sale, after Count closed down its bingo operations there earlier this year. - Another part of the ex-ABC Regal, Sauchiehall Street has been let out to a large sports bar. This will fill approximately half of the old auditorium space, and utilise the extended portion of the facade as an entrance. The only remaining unlet unit in the development is the central portion incorporating the original entranceway. Now - some new stuff at last! Thanks to a trip to the USA, have added some pictures of cinemas from Chicago, Illinois, Madison, Wisconsin, and Ramona, California. Also, an interestingly named cinema in Cape Town, South Africa, thanks to Robin Owen and Sophie Dale. Graham Kelly sent some pictures of the Playhouse, Dalkeith and the Pleasure Island cinemas in Lytham St. Annes. Courtesy of Norrie Mcnamee and Graham Crawford, the Alhambra Keswick. Gary Painter has also been busy, allowing me to add cinemas in (deep breath): Fort William, Kilmarnock, Stevenson, Largs, Stonehouse, Girvan, Galston, Kilbirnie, Lanark, and Saltcoats, as well as Brecon in Wales. Apologies for the lack of updates recently - I've been busy moving into a new flat (also apologies to anyone whose email I have not yet responded to!). Normal service should now be resumed. A nice big update today, mainly thanks to the many people who have been sending in contributions. First of all, a little back-slapping. I have obtained the viewing statistics for these web-pages. They are in the top-thirty most popular pages served from this particular server, and get between 900 and 1500 visits a month, which is quite amazing. Thanks to everyone that is stopping by to have a look! A new website has just been set up with a selection of historical and interior photos of the Odeon Edinburgh (ex-New Victoria) - click here to visit it (external link). Updated the To-Do list introduced in May - many thanks to the numerous people who sent comments, clarifications and corrections - please keep them coming. Thanks in particular to: Gordon Blackburn, Kenny Duncan, Ray Dunns, Mervyn Gould, Ian Grant, Graham Kelly, Norman Mcnamee, Jim Mitchell and David Simpson. A great selection of pictures of the interior of the Glasgow Film Theatre (ex-Cosmo) thanks to Emma Taylor. Some photos of the interior of the Anniesland Ascot just prior and during demolition, thanks to Frank Watson. Norman Mcnamee kindly sent a photo of the ex-Cinema, Loughgelly. Information and photos of the new dual-nightclub conversion of the ex-Capitol, Aberdeen thanks to Tom Widdows. Last and definately not least, Graham Kelly has sent pictures from Bathgate, Berwick, Boness, Burnham-on-Sea, Burntisland, Cowdenbeath, Dunfermline, Livingston, Bristol, Cardendan and Newport-on-Tay. Phew! Bad news first - Graham Kelly reports that the Westway, Cardonald has been demolished. It has therefore been moved to the 'totally gone' section of the Glasgow page. Also, Pauline O'Neill reports that demolition work is well advanced at the former La Scala, Greenock. A few corrections and clarifications: Tim Addyman kindly corrected some of my assertions and information about what used to be cinemas on the York page, and so the pictures purporting to be the Regal (actual cinema demolished - picture was of wrong building!) 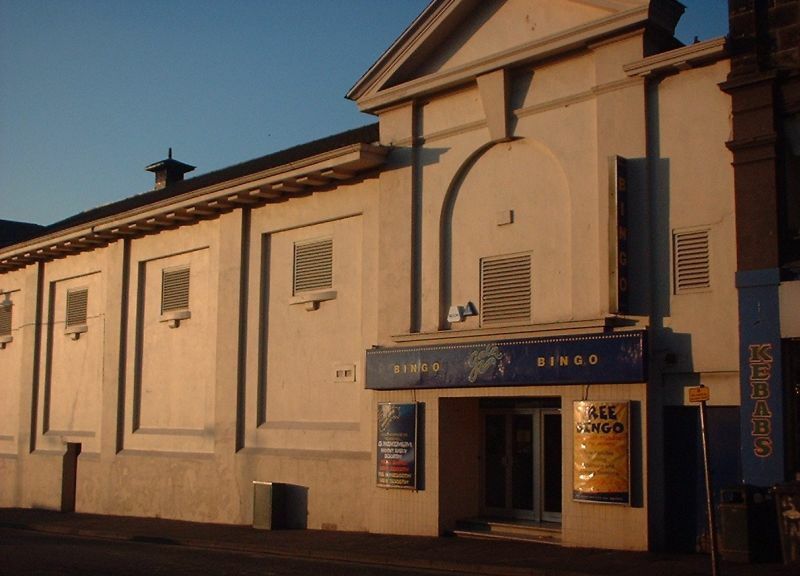 and Scala (actually also demolished) have been removed ; and Donald Kirkbryde has informed me that what I was calling the Kinema cinema in Fife was in fact the Alhambra. In other news, the Odeon Lothian Road is now expected to open around September, and a new 10-screen Odeon is now planned for Aberdeen. A page has been added for Seattle thanks to some pictures sent by Colin Alexander. Finally got around - after some prodding! - to updating the Links page of the site - checked the links, added many more, and removed outdated and broken links. Suggestions for additions or corrections are welcomed! The last item is a new feature for the site - a To Do List as it were. It lists all the cinemas I have any info about that I do not yet have either pictures on the website, or confirmation that they have been demolished. I would welcome information as to omissions, or incorrect inclusions, or even pictures of anything on the list - any feedback on it all would be welcomed. Thanks to a trip there, added a page surveying the surviving cinemas and theatres of York. Added a page with some photos of the Odeon Rochdale, kindly provided by the manager there, Colin Alexander. Added a nice picture of the current Grosvenor interior, as seen from across Ashton Lane, as well as some nice interior shots of the Theatre Royal, thanks to Gary Painter. Bad news: planning permission has been granted to demolish the Toledo, (ex-ABC Muirend) to build flats, retaining only the facade. More soon. Thanks to an anonymous contributor, more pictures of the Grosvenor have been added, this time showing a fascinating glimpse of some surviving internal features. More pictures of the Grosvenor have been added, showing the ongoing demolition work, and revealing a few more features of interest. Several new cinemas, including the wonderful Dominion, added to the Edinburgh page. Much additional dates and information added to existing Edinburgh pages as well. New pages also added for Leith and Portobello. Finally, a picture of the ex-King's Cinema, Montrose added thanks to JTK Barr. The closing dates for the Glasgow Odeon Renfield St, and Edinburgh Odeon Clerk St, have both been confirmed for April 24th 2003. Watch this space around that time for some major Odeon-related updates we have planned to mark their passing - exclusive to this site! Added pages for Kilmarnock, Cumnock, Falkirk, and Wishaw thanks to Graham Kelly. Major update to the Stirling pages, as well as new pages for Cumbernauld, Denny, and Evesham thanks to Alan Bunting and Hugh Thomson. These feature both current and archive photographs. Demolition work continues apace at the Grosvenor in Hillhead; the only positive side is that it is revealing so much of the original interior decoration as it does so - some more pics have been added showing the front of the circle, and the original roof decoration still in situ (for the moment!). Added a pic of the remains of the foyer of the ABC Regal, Sauchiehall Street, showing a little of the remaining original decoration uncovered by the demolition work. Thanks to Roddy Buxton, a page of shots of the projection facilities of the Savoy, Nottingham has been added. Finally, a few shots of the interior of the King's Theatre, Glasgow. Have added a whole new page of photos from inside the Britannia Panopticon Music Hall, and fixed some errors in the building history, thanks to Judith Bowers and the Britannia Music Hall Trust. Added a photo taken during redevelopment works at the Grosvenor, showing the remains of the original circle above the twin cinemas formed from the stalls. Added a few details about the Motherwell Odeon, again thanks to Janice Clark. Added a page for Chester, with some photos by Gary Painter. Thanks to Ian Grant and James Joss, have positively identified the unknown Kirkintilloch cinema as the Black Bull. Major site redesign and re-organisation. A new main page makes the increased emphasis on cinemas further afield from Glasgow more obvious. All internal links checked for consistency, and major behind-the-scenes tidying done. The Edinburgh, Aberdeen and Ayr pages are also completely redone, to stop them taking half an hour to load! Future plans include expanding and adding detail (especially to the Edinburgh page), as well as improving page-loading times - especially on the more image-heavy pages. Added notes to various pages making clear the latest developments - especially for the Grosvenor, Odeon Renfield St, Odeon Clerk St, Coliseum etc. Added interior picture of the now-demolished Odeon Motherwell - thanks to Janice Clark. Added a couple of night-time pics to the Canterbury page. An update coming soon should include some interior pics from the Savoy, Nottingham, as well as more Stirling pictures courtesy of Alan Bunting.